emmatree: . 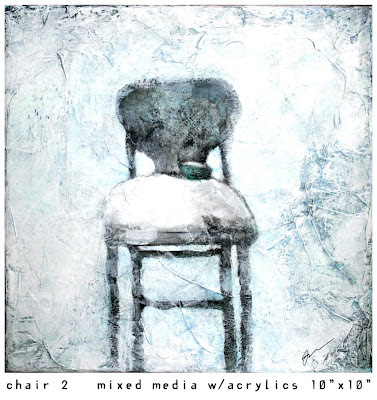 . . & Chairs - Oh MY! They're old chairs - both for children. holding a pillow & a candle in a blue bowl. Chair #1 sits in the living room. who've sat in them in the past. how much stubbornness on display? all that energy on display. I hope they all came true. I love those chairs and the sense of history that go with them! Good luck and have fun my artist friend!!! Thanks for visiting my blog and commenting on the Peonies~they are a sight to behold. I LoVe your Art! Glad to discover you, I am adding you to my favs! Your big day is here!!!!! So much heart and soul has been poured into the days leading up to this special day...I SO WISH I could go to your show. I wish I could soul travel right to your paintings and sit next to each one as I contemplate the beauty there. Wishing you a day of fulfilled dreams and childlike excitement. I will be thinking of you with a smile and a great big hug. Yeah! It's here! I wish I could be there but know that I am with you in spirit! And ditto on what Jaime said! 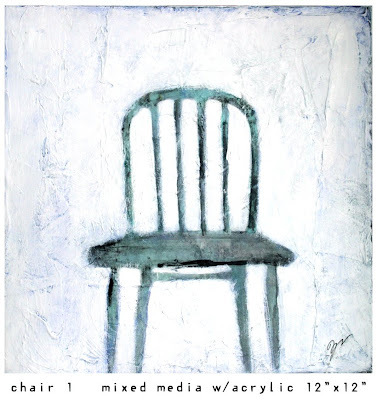 Chairs and blue, two of my most favourite things. All objects should possess the ability to talk, then we'd have stories! Oh How i do love the blue and white, hope that the show goes well! Love, love, love these chairs and what you've written about them. I too have a thing for chairs, especially old chairs. Chairs with a history. As you put it, "all that energy on display."